Style maven turned business maverick Jay Knox talks about his new business concept in Elizabeth. Jay Knox made national headlines in 2017 when a Coachella-bound Cam Newton donned a floral shirt and shorts (dubbed “The Romper”) from Knox’s Charlotte retailer, SCORE. Recently, Knox—a Queen City native with a penchant for game-changing business ideas—sold SCORE, and he has now launched a new concept in Elizabeth: Outpost Mercantile and Outpost Cafe. OTPST, for short, is a retail spot with a coffee shop located inside ColsenKeane Custom Leather Goods. Knox is bringing everything from fine jewelry to T-shirts, pottery to vintage clothes, to a space that had largely been dedicated to a leather workshop. 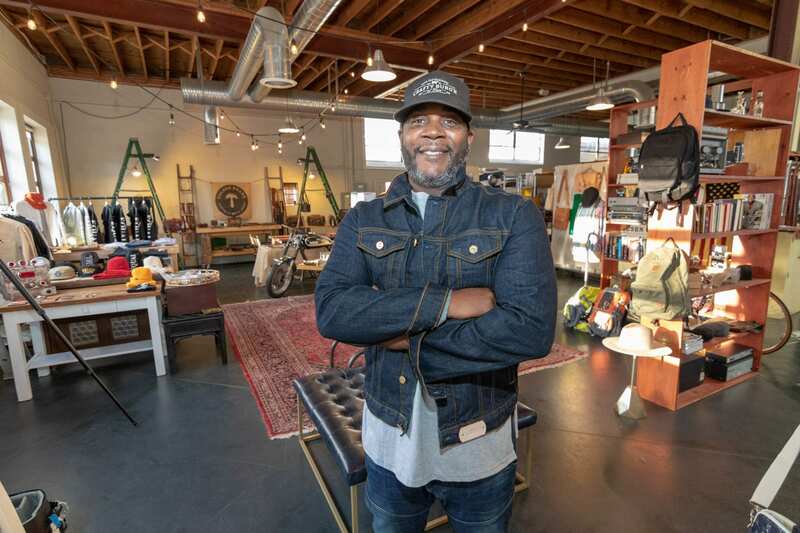 As for ColsenKeane owner Scott Hofert, his business is predominantly online, so having a cafe and retail showroom allows the physical location to get more foot traffic—and thus, local customer engagement. Now retail and handiwork are going on simultaneously. Weeks before OTPST’s grand opening celebration on Feb. 9, Knox talked with SouthPark about the power of fashion, testing business concepts, and the moment his wife saw Newton’s notorious outfit. What makes the OTPST concept distinctive? OTPST is a vintage-inspired retailer selling apparel, accessories, hand-crafted leather goods, along with a full cafe serving Stumptown coffee, teas, and gourmet waffles. We work with companies trying to build something unique and well-crafted and we help to bring it all together. Currently, we are in the process of bringing the OTPST concept to several business in North and South Carolina. What does serving coffee in a leather goods store do to help local businesses? First, who doesn’t love coffee or tea? And if you don’t, you probably still love the smell. Once you add the smell of leather to that, it’s magic. When you have a shop producing some of the best leather goods in the world right here in Elizabeth, why not give the neighborhood a chance to sit down and enjoy a cup of coffee while watching leather being hand-crafted right in front of them? You can also come in and get fitted for a great pair of Red Wing Boots while enjoying nice espresso. Now that’s a great shopping experience. Why choose the Elizabeth neighborhood for your new concept? The Elizabeth neighborhood is so important. It’s growing and changing. You’ve got an older building that’s been here for a while that has a cool, vintage vibe to it, and now you can come here and support local, support stuff that’s handmade right here in Elizabeth. What does fashion do for a community? Fashion gives an opportunity for people to put a stamp on their own style, and in turn, their community. One thing I’ve learned about Charlotte is how eclectic this city has become, and I’m loving it. We specifically chose to locate our new store OTPST in the Elizabeth/Plaza Midwood neighborhood because of its style diversity. Describe the experience with the Cam Newton “romper” at SCORE. ← Interior designer Ally Whalen transforms a dark home into a sophisticated and bright space for a family of four.